Dear readers, when I got the Secret Recipe Club assignment for this month I went into full-happy-dance mode! It turns out that I’ve been paying attention to Chocolate and Chillies for a looong time, and hoping I would be paired with it, to stalk it real good. And that is exactly what I did. Asiya, the hostess of Chocolate and Chillies, has a ton of recipes that entice me. She was born and raised in Toronto, where she now lives with her husband and two kids, but her family is originally from India. Her blog features recipes with a heavy Indian influence, and to make it even better, many are her own family recipes. I love it! I bookmarked many options, but five were the strongest contenders. Here they are: Butter Chicken (lower in fat than regular versions), Mummy’s Tomato Spiced Rice, Whole Wheat Banana Muffins, and… Afghani Kebob with Tomato Gravy. The fifth? 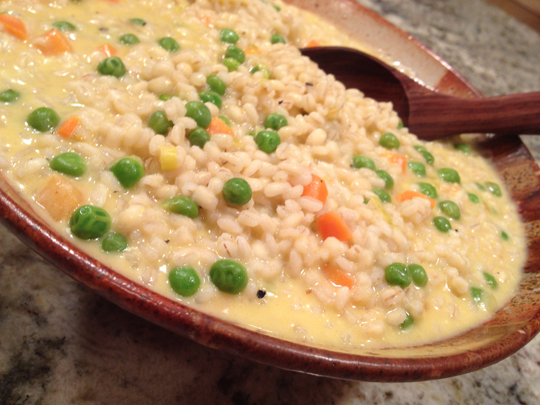 It’s the one I ended up making: Barley Risotto with Peas and Asparagus. Oh, my…. what an amazing dish this was! I made a slight adaptation because the asparagus looked very sad at the grocery store that day, so I went with carrots. Boil the vegetable stock. Reduce heat to medium-low to keep it warm.Heat olive oil in a large saute pan over medium heat. Add the minced shallot and leek. Saute 5-7 minutes until tender. Add barley and stir for a minute so that everything is well coated. Add 1 cup broth and stir until most of it has been absorbed. Continue to add 1/2 cup hot vegetable broth at a time, stirring until it has been absorbed before adding the next 1/2 cup. While the barley is being cooked, microwave the pieces of carrots with a little water until almost tender, and reserve. Or you can cook them on top of the stove in a little salted water, and drain them well. After 15 minutes of cooking the barley, add carrots and peas. Stir in salt and pepper. Continue to add water until barley is cooked through. Remove from heat. Add lemon juice, cream cheese and Parmesan cheese. Stir until cheese is melted. 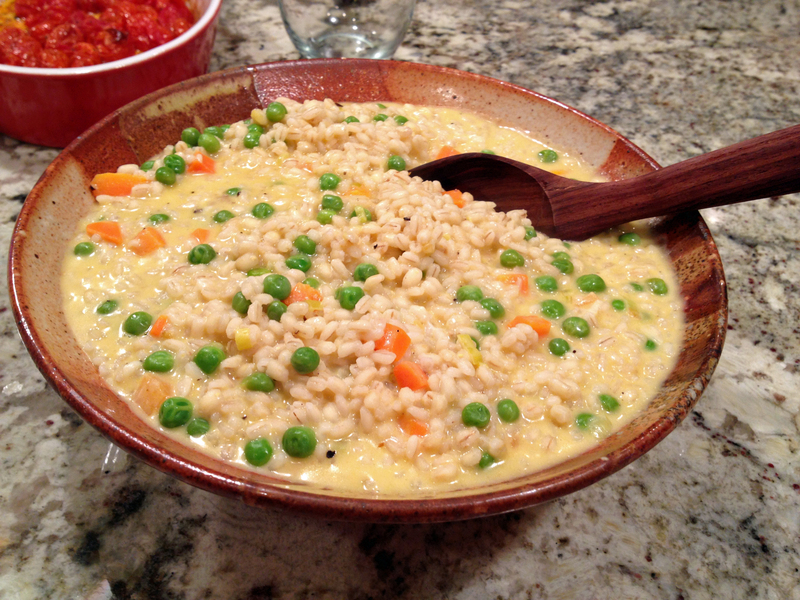 Comments: This was such a creamy, comforting dish, I love the traditional risotto made with Arborio rice, but this version with barley won my heart! I definitely want to make it with asparagus to celebrate the arrival of Spring and with it that infusion of life and joy and all things sunny and beautiful and gorgeous and warm into my personal equation. Can you detect my excitement as February says goodbye? I bet you can. 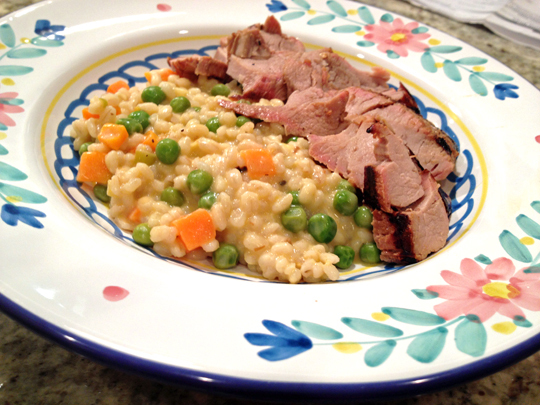 The barley risotto was served with grilled pork tenderloin, but for the next couple of days the risotto all by itself was my lunch. It tends to dry out a little bit in the fridge, but a little squirt of lemon juice brings it back nicely. I am not sure this could work for a risotto fritter like a regular rice risotto would, it seems to me that the grains of barley would be hard to keep together, but if anyone tries it and succeeds, let me know. Asiya, I had a blast stalking your blog and picking a recipe to cook from! For those interested in following the cooking adventures of the other Secret Recipe members in my group, poke the cute blue frog at the end of the post, and have fun!